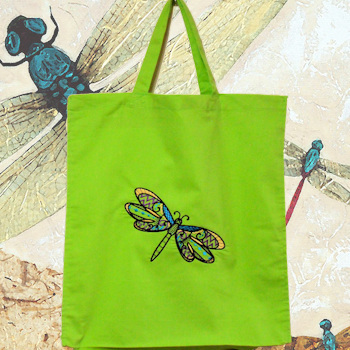 Dragonfly art design embroidered cotton tote bag perfect for the beach or weekends away, books or shopping. Fresh Lime Green colour cotton bag with bespoke dragonfly embroidery. Makes an excellent gift for birthdays, Christmas, anniversaries and Fathers Day. Even use as a school book bag, hobby bag or sports/dance bag!